September is Library Card Sign-Up month, when the American Library Association and libraries across the country remind parents that a library card is the most important school supply of all and the “smartest card” in every wallet.. This year’s Honorary Chair is Candace Parker – WNBA star and Olympic gold medalist. Print and audio Public Service Announcements (PSAs) featuring Parker are available for download, as are sample press materials, including a press release, letter to the editor, proclamation, PSA scripts and smartest card logos. 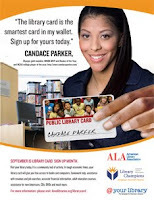 For more information, see ALA Campaign Coordinator Megan McFarlane at www.ala.org/librarycardsignup. Library Card Sign-Up Month has been observed each September since 1987. Public and school libraries often work together to promote it. Ideally, school districts should include library card sign-up information for all new and returning students.